Wellbrook Winery is more than a winery, it's an experience. Offering the finest fruit wines in the Fraser Valley. 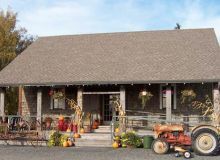 The focal point of our 55-acre heritage farm is The Old Grainery Store, lovingly restored by owner Terry Bremner. Surrounded by century-old beams and antique furnishings and fixtures, guests are invited to sample from our unique selection of table and dessert wines. Or simply feel free to browse our shop for wine accessories and giftware while enjoying the historic atmosphere. Owner Terry Bremner started Wellbrook Winery with the goal to be more than just a winery, he also wanted it to be a truly unique experience. Terry believes that by providing excellent wines and juices as well as other gourmet products in a unique setting that this will provide a great experience and fond memories of their visit for the guests. With Wellbrook delicious fruit wines, as with Bremner's premium fruit juices, quality is of the utmost importance. 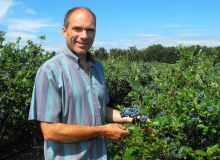 The premium blueberries that the Bremner's family has been growing in Delta for over 30 years is what prompted Terry to create his own premium blueberry juice and then fruit wines after much success with these premium juices. Terry has been producing Bremner's premium pure juices for about 10 years now, and producing Wellbrook wines for almost 8 years. Terry enjoys the farming lifestyle and produces many healthy products from Bremner's fresh premium blueberries, cranberries and other fruits. Terry likes to give back to the community by hosting many events throughout the year, with the largest event being Wellbrook's "SUMMERFEST" held every summer in July. Over 3500 people attend this fantastic family fun event and partial proceeds go to Delta Hospital Auxiliary. Summerfest is our annual anniversary celebration and this year it is our 8th anniversary. Wellbrook Farm is a Heritage site with buildings over a 100 years old. The three buildings restored by owner Terry Bremner are the farmhouse, grainery, and barn. 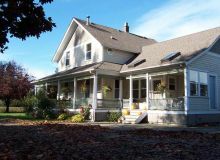 In 2011, Terry was awarded Delta Heritage Award of Merit for the preservation of the Seymour Huff Residence & Barn 1903. Terry grew up in the area and was in fact the paper boy for the farm when he was growing up. He currently lives in the original farm house. The wine shop is located in the old grainery with it's original floors , walls, and many antiques including windows from the 1890's. The old stove & fridge and many other unique antique furnishings give this special wine shop it's character and charming atmosphere. The old heritage barn which has a 40ft centre ceiling has amazing acoustics, and Terry has hosted many events here including plays and operas. Sarah McLaughlin also did some recording for the video Charlotte's Web in this old barn. 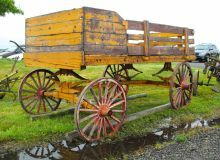 Wander outside to admire the carefully restored exteriors of the old farmhouse and barn, as well as the vintage tractors and other farm equipment found about the property. Five acres of organic blueberries and five acres of cranberries have been planted on the property. Besides Wellbrook farm, the Bremner family also has an 80 acre blueberry farm about a mile away and a Cranberry farm in Fort Langley. Wellbrook Farm is a delightful setting for a day trip. It is only 10 minutes from the Tsawwassen Ferry, 30 minutes from Vancouver, and 15 minutes from the Peace Arch Border Crossing. Sample our delicious fruit wines and pure fruit juices in the restored Old Grainery.